Amid laments about the crisis of the humanities, it’s good to read about the power of humanities in times of crisis. Essayist and scholar of Anglo-Saxon literature Irina Dumitrescu’s introduction outlines the “tension between the productive and destructive aspects of crisis,” before her book unfurls gorgeous and painful evidence of “a special relationship between crisis, time, and the arts.” Poetry, for dissidents imprisoned by Romanian communism, was “meditation … occupation … secret code … food.” Jail was “university.” “Tyrants,” she writes, “can be such good literary critics, censorship the best reading list.” The materials she collects range beyond Romanian prisons; for me some of the most powerful were the cookbooks salvaged from the Terezin concentration camp by Cara de Silva, Tim Albrecht’s gripping essay on Primo Levi, and William Coker’s description of classroom teaching in modern Turkey as “counter-interpellation.” Original poems by contributors also demonstrate the power of humanities to speak back to crisis. 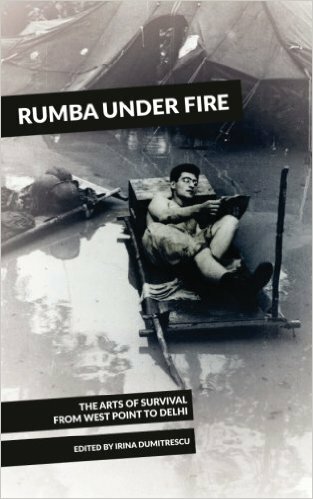 The book’s title describes a form of Congolese music that serves as “one of the primary means of softening the harsh realities of everyday life by commenting on them with subtle irony or by normalizing them as shared fate.” In a world under fire and on fire, such music helps humans endure. It’s been a banner year for Anthropocene books, with at least a half-dozen provocative titles calling out from my bookshelves: Ecology on the Edge! After Nature! The Capitolocene! Staying with the Trouble! Dark Ecology! Shock! My if-I-had-to-pick-just-one from this varied lot is a study of Anthropocene as a discursive term, especially in the geological and stratigraphical sciences, written by an English professor from Leeds. 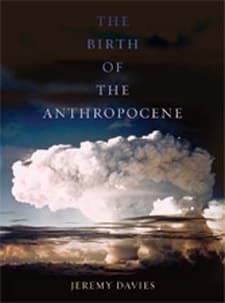 Opening with a lucid rejection of “sustainability,” which he calls “the greens’ highest objective,” Davies turns his focus instead toward redressing “environmental injustice and…fostering ecological pluralism and complexity.” He contextualizes the Anthropocene within the broader turn to “neocatastrophism” in the earth sciences. Earth history teems with catastrophe. Dense and clear, the book lays a groundwork for a forward-looking rather than nostalgic understanding of the Anthropocene, although he does not minimize the destructive changes underway. Emphasizing that “despite its name, the Anthropocene is not an anthropocentric concept,” Davies insists that we must adapt new perspectives. “Against the flattening and simplifying impulse of the end-Holocene event,” he writes, “there is only this: the struggle for plural ecologies.” The book’s final fifty pages – “An Obituary for the Holocene” – renarrate the history of humanity in contact with nonhuman nature in bracingly geophysical terms. It’s a book with which to think plural futures. Now more than ever I want ecstatic and dazzling art – beauty that pushes into our political and environmental crises without entangling itself in loathsomeness. That means that today I need, as I always need, America’s greatest and fiercest poet, Emily Dickinson. I’m so pleased that this beautiful little volume found its way to me as 2016 slouches toward its close. Late in Dickinson’s prolific yet largely un-public career, after she stopped collecting poems in the manuscript notebooks critics now call her “fascicles,” she wrote numerous short poems on oddly-shaped bits of envelopes. 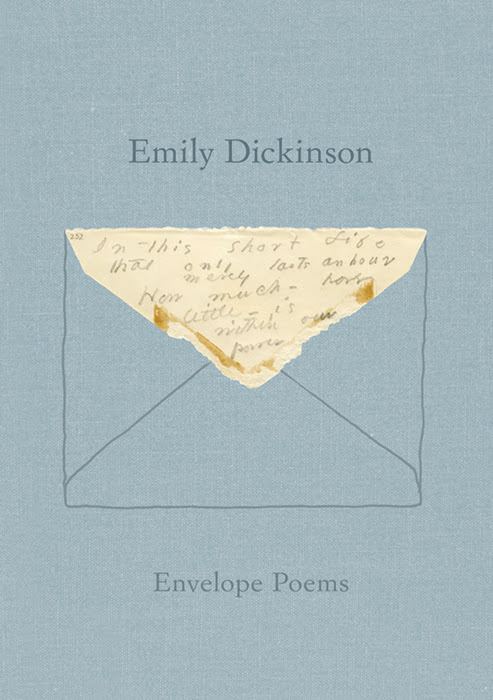 The cover of Envelope Poems reproduces the triangular upper flap of one small envelope, with an enigmatic verse tapered to fill the space down to its descending point: “In this short life / that only lasts an hour / How much – how / little – is / within our / power.” At the bottom point of the downward-facing triangle, the word “power” in Dickinson’s pencil hand sits like the sharp end of a spear. Profundity, grace, power, explosion: all of it shaped and contained by an enveloping scrap. The book reproduces a couple dozen lyrics and the envelopes that contain them. So shines great art in this naughty world.